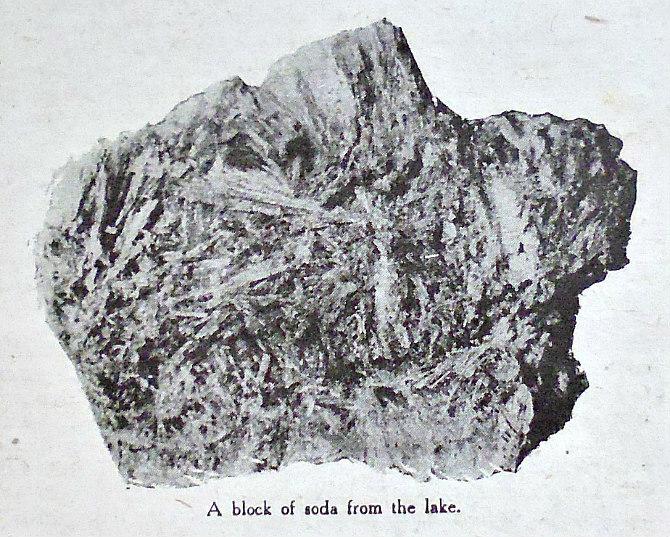 A block of Soda from the lake. The Story of a Wonderful Natural Curiosity of British East Africa “The following article is a striking instance of the immense and sometimes inexhaustible wealth which is waiting to be exploited in British possessions in Africa. Much of that wealth is still hidden, but in the case of Lake Magadi—a lake of solid natural soda covering an area of some thirty square miles—it was there for any enterprising explorer to discover and report to the right quarters. The story of the commercial development of this great Colonial asset adds a fresh chapter to the ever-enthralling romance of British industry. “Could there be a less promising starting-point for a story of discovery and adventure? So devoid of the slightest tinge of romance is such a bald statement that there is a risk of the searcher passing it over disdainfully. And yet, if he continues his investigations, he may indeed find that a very pretty tale of human endeavor, coupled with the unfolding of many curious said-issues, hangs thereon for his own and his readers’ delectation. “This declaration naturally aroused the greatest interest. It is not every day that a discovery with “vast possibilities commercially” is announced in the City, and if this lake of soda did really exist, was not a mere figment of the explorer’s imagination, his listeners had no need to be told that it might become a veritable gold-mine. The demand for soda is universal. Instinctively the partners began to pass the manifold users of soda in review. “Soda crystals are used in practically every household the world over for washing purposes. Carbonate of soda (otherwise known as soda ash) and caustic soda are largely used in numerous industries, as, for instance, by soap, glass, and paper makers, as well as by textile manufacturers for printing, bleaching, and dyeing, etc; whilst bicarbonate of soda is used for the manufacture of baking powder and mineral water. “The prospect was alluring. True, this commercial proposition would mean the investment of a few hundred thousand pounds—probably up to half a million sterling—in addition to a good deal of hard work. But think of the return : a steady annual profit running into millions ! Unquestionably (the firm decided, after discussing the matter in all its bearings) they must institute an inquiry and, if the report they had heard were substantiated, see what could be done to secure the rights over these invaluable soda deposits. “Accordingly, Messrs. M. Samuel and Co. sent a confidential representative to British East Africa to verify the explorer’s statements. And this he did, many months later, by bringing back with him large samples taken from thirty-five different places over the whole area of Lake Magadi, which he described in even more glowing colours than his predecessor had done. “This conclusive evidence clinched the matter. The firm at once entered on protracted negotiations with the Colonial Office, and obtained from the Crown Agents for the Colonies, acting on behalf of the Government, an agreement, giving them the option of acquiring direct from the Government about three hundred and twenty-four square miles of territory, including Lake Magadi, for a period of ninety-nine years, with the right of working the soda (subject to the rights of natives to take soda from the deposit for their own purposes), and of constructing a line of railway connecting the deposit with the main line of the Uganda Railway. “These preliminary steps having been taken, a fully-equipped surveying expedition was sent out in November, 1909, under Mr. Frederic Shelford, a well-known railway engineer who had done valuable survey work in Africa. The other leading members of the expedition were Mr. W. H. Levy and Mr. A. E. Herz, two directors of the company that had been formed to exploit the lake of soda; Mr. A. H. Endemann, who had studied on the spot the question of the most suitable mechanical appliances for dealing with the deposits; and Mr. Arthur Trobridge, who had been engaged in the soda business for many years, and whose report was therefore looked forward to with considerable interest. “The expedition reached its destination, after an uneventful march from Magadi Junction, the nearest point on the Uganda Railway, on December 1st, and found , immediately prior to its arrival, that considerable rain had fallen. Consequently the whole of the lake, inclusive of some sand flats at its southern end, was covered with water, in depth from six inches to one foot. This was distinctly disappointing. However, it soon became evident that this was only a temporary inconvenience, and, indeed, by the time the explorers left the district ten days afterwards the water had considerably subsided, and a large area of the surface was already dry. 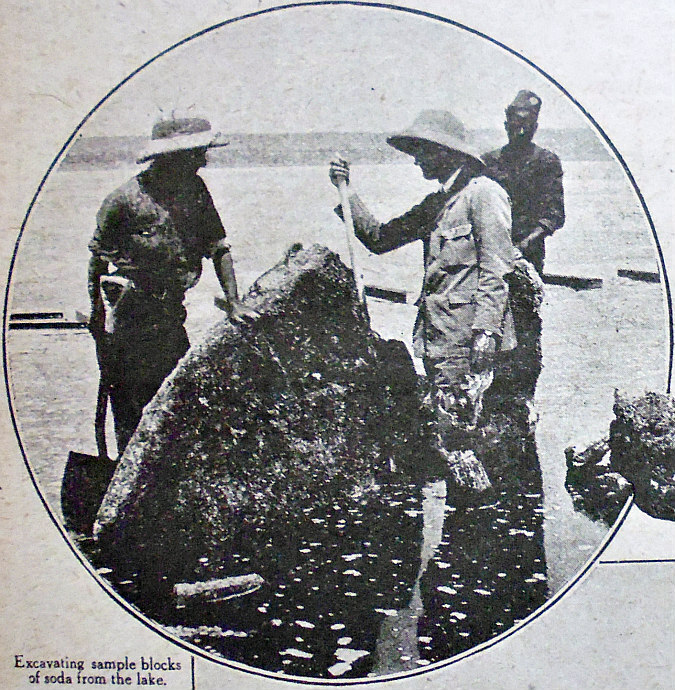 Excavating soda blocks from Lake Magadi. “As to the chemical and physical character of the soda, they were found to be uniform over the whole surface of the deposit, as has been confirmed by the examination of numerous samples taken at widely-distant points both in 1909 and on the occasion of Mr. Trobridge’s previous visit in 1904. The crystalline deposit cleaved readily into blocks from which the “mother liquor” drained rapidly, leaving a friable mass of crystals. “The explorers also came to the noteworthy conclusion that there was good reason to assume that the deposit of soda extends to the full depth of the lake, the above-mentioned “mother liquor” only filling the interstices of the crystals. They sank a bore-hole in the lake through a continuous mass of crystalline soda to a depth of nine-feet, but with the primitive boring tools at their disposal they found it very difficult to proceed farther. Indeed, in view of the enormous bulk of soda thus disclosed they saw no practical object to be attained by boring to a greater depth. “Further, there were evidences, runs the report, that the quantity of soda already in the lake is being continually augmented. In addition to many surface springs and streams discharging considerable quantities of soda into the lake, there were evidences of large springs in the bed of the lake itself, which intrude saturated soda liquor. On the removal of the soda already crystallized the liquor which takes its place at once starts to reform the crust. The Indians engaged in this soda industry informed Mr. Trobridge that the crystalline mass is replaced so rapidly that they rework the same spots year after year. Of this he found full confirmation on examining several poles which they had been using to break up the soda and had left in the holes thus made. These poles were firmly set in a solid mass of crystals which had been formed around them, and Mr. Trobridge and his colleagues removed several large blocks of soda in which such poles were embedded. On examination they found this reformed soda of the same composition and purity as the permanent deposit. “In view of the fact that the crystalline soda is divided into several distinct horizontal layers, which are readily separated from each other, and for economy in working. Mr. Trobridge recommended that operations be confined to the upper layers, which he estimated contain about forty million tons in sight. As this vast quantity would be continually replaced, the lower layers would appear to have little more than theoretical interest. Should, however, it be deemed necessary to work these lower layers to the depth of nine feet, as disclosed by their bore-hole, he estimated that the total crystalline soda would be about two hundred million tons. “Two hundred million tons of soda capable of being converted, by very simple treatment, into a “soda ash” of great density, and equal in chemical purity to any soda ash on the market—a practically inexhaustible stock, since, as soon as part of the deposit is removed, it begins to form again. Think of the enormous profit to be drawn from such a source of wealth as that. Counting all expenses, the fortunate merchants who had got wind of this business deal came to the conclusion that a profit of at least twenty shillings per ton of soda products might be expected. Rarely does it fall to the lot of a City firm to see a profit of at least two hundred millions sterling in view. “Mr. Frederic Shelford’s report on the feasibility and cost of constructing the branch railway whereby the vast soda deposits of Lake Magadi could be rendered accessible was equally encouraging. He examined the country between the lake and the Uganda Railway, and eventually selected a route which was afterwards carefully surveyed in detail by the railway survey party. Lees, George Frederic, The article ‘The Lake of Soda’ was published in ‘The Wide World Magazine – An Illustrated Monthly Of True Narrative’, Vol. XLII – October 1918 To March 1919. George Newnes Ltd., Southampton St., Strand, London. Categories: Misc Subjects | Tags: The Lake of Soda by George Frederic Lees | Permalink.